Today Beacon Hill brings to mind images of affluence and luxurious living, yet until the end of the 19th century it contained a community of free blacks and escaped slaves from the southern states who owned businesses, built houses and schools, and worshipped together in the churches. 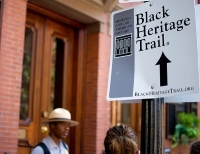 Although the black community has since shifted to other parts of Boston, the Black Heritage Trail covers 14 sites important in local black history. Massachusetts was the first state to abolish slavery in 1783. Beginning at the Boston Common, there is a memorial to slave abolitionist Robert Shaw who led the first black regiment recruited during the Civil War. Various sites on Beacon Hill include homes of famous citizens, the city's first racially integrated public school with exhibits portraying the struggle for equal school rights, and a house that was part of the famous 'Underground Railroad' that sheltered runaway slaves from their pursuers. The African Meeting House, part of the Museum of Afro-American History, is one of the most interesting stops on the trail. It was the first black church in the United States, known as 'Black Faneuil Hall' during the anti-slavery campaign. Here, famous abolitionist speeches were made and black people were called to take up arms in the Civil War. There is an informative audiovisual presentation in the gallery. Although a self-guided trail with brochures and maps provided by the Museum of Afro-American History, park rangers also give free daily two-hour tours, which start at the National Park Service Visitor Center.